Although over 7,000 different apple varieties exist, most apples have a similar nutrition profile. This favored fruit is a low calorie, high fiber food offering many beneficial macro and micronutrients. 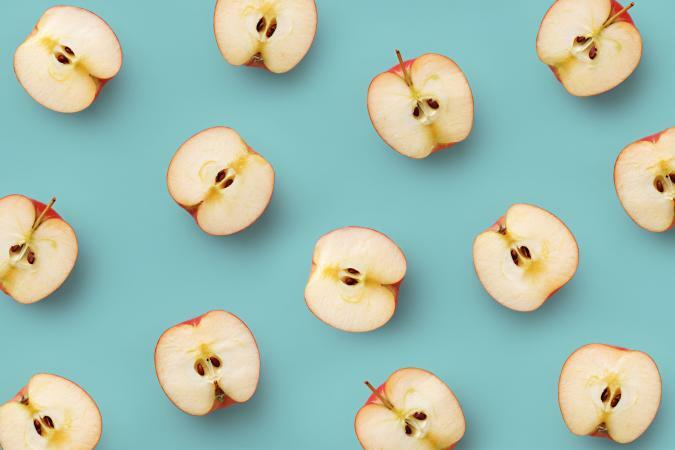 According to the USDA, a medium apple, which is about 3 inches in diameter, that still has its skin on contains 95 calories, 25 grams of carbohydrate, 0.47 grams of protein, and 0.31 grams of fat. As a bonus, a medium apple is a good source of fiber, providing 4.4 grams or about 17 percent of the RDA. Apples are excellent hosts of vitamins and minerals. Medium apples are sources of potassium, vitamin C, thiamin, riboflavin, vitamin B6, vitamin E, and vitamin K. Apples can be considered a superfood in their own sense as they contain a large collection of phytonutrients and phenols found in the skin and inner apple. These nutrients aid in heart health and include anthocyanins, flavonols, flavonol glycosides, and dihydrochalcones. Among the many apple varieties, the basic nutrition profiles are quite similar. However, recent research tests the differences among apple varieties including antioxidant and sugar content. A 2013 study compared Braeburn, Fuji, Gala, Golden Delicious, Granny Smith, McIntosh, and Red Delicious apples, finding Granny Smith apples contained the greatest amount of health-promoting extractable phenolics, non-extractable proanthocyanidins, and dietary fiber. Additionally, Granny Smith apples contain less sugar than most red apples. Although there are some slight differences between apple varieties, most are similar in nutritional content. It is clear apples are a nutritious food, offering fiber, antioxidants, and minimal calories. Although some apple breeds differ slightly, all are a healthy option to add to any diet.